An amoeba (pronounced uh-MEE-buh) is any of several tiny, one-celled protozoa in the phylum (or primary division of the animal kingdom) Sarcodina. Amoebas live in freshwater and salt water, in soil, and as parasites in moist body parts of animals. They are composed of cytoplasm (cellular fluid) divided into two parts: a thin, clear, gel-like outer layer that acts as a membrane (ectoplasm); and an inner, more watery grainy mass (endoplasm) containing structures called organelles. Amoebas may have one or more nuclei, depending upon the species. The word amoeba comes from a Greek word meaning "to change." The amoeba moves by continually changing its body shape, forming extensions called pseudopods (false feet) into which its body then flows. The pseudopods also are used to surround and capture food—mainly bacteria, algae, and other protozoa—from the surrounding water. An opening in the membrane allows the food particles, along with drops of water, to enter the cell, where they are enclosed in bubblelike chambers called food vacuoles. There the food is digested by enzymes and absorbed into the cell. The food vacuoles then disappear. Liquid wastes are expelled through the membrane. Water from the surrounding environment flows through the amoeba's ectoplasm by a process called osmosis. When too much water accumulates in the cell, the excess is enclosed in a structure called a contractile vacuole and squirted back out through the cell membrane. The membrane also allows oxygen to pass into the cell and carbon dioxide to pass out. and pulls apart to form two identical organisms (daughter cells). This occurs after the parent amoeba's genetic (hereditary) material, contained in the nucleus, is replicated and the nucleus divides (a process known as mitosis). Thus, the hereditary material is identical in the two daughter cells. If an amoeba is cut in two, the half that contains the nucleus can survive and form new cytoplasm. The half without a nucleus soon dies. This demonstrates the importance of the nucleus in reproduction. Some amoebas protect their bodies by covering themselves with sand grains. Others secrete a hardened shell that forms around them that has a mouthlike opening through which they extend their pseudopods. Certain relatives of the amoeba have whiplike organs of locomotion called flagella instead of pseudopods. When water or food is scarce, some amoebas respond by rolling into a ball and secreting a protective body covering called a cyst membrane. They exist in cyst form until conditions are more favorable for survival outside. Asexual reproduction: Any reproductive process that does not involve the union of two individuals in the exchange of genetic material. Cytoplasm: The semifluid substance of a cell containing organelles and enclosed by the cell membrane. Organelle: A functional structure within the cytoplasm of a cell, usually enclosed by its own membrane. Osmosis: The movement of water across a semipermeable membrane from an area of its greater concentration to an area of its lesser concentration. Protozoan: A single-celled, animal-like organism. Pseudopod: From pseudo, meaning "false," and pod, meaning "foot"; a temporary extension from a cell used in movement and food capture. Some common species of amoebas feed on decaying matter at the bottom of freshwater streams and stagnant ponds. 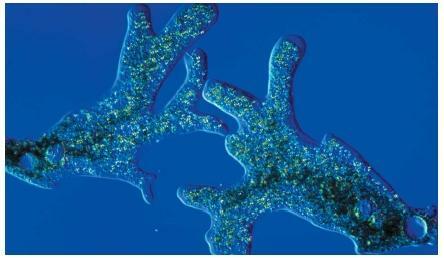 The best-known of these, Amoeba proteus, is used for teaching and cell biology research. Parasitic species include Entamoeba coli, which resides harmlessly in human intestines, and Entamoeba histolytica, which is found in places where sanitation is poor and is carried by polluted water and sewage. Infection with Entamoeba histolytica causes a serious intestinal disease called amoebic dysentery, marked by severe diarrhea, fever, and dehydration. Thanks for this article about Amoeba's you have educated me about Amoeba's alot.Thank you. This was great information for my Biology class. We have to fill out a lab report about Ameoba and Anabaena. If only I could find information on Anabaena. Thank you. Thank god that someone is actaully able to give out decent information! this is the exact information i desperatly needed for my science project. thank-you!! Thank you so much for this interisting site. You did a great job in explaining the amoeba in a simple way. It helps a lot. as the liver, spleen or lungs? Thank you very much! I saw a disfigured pic of a white males head under the title amoeba protoza, is this some type of rare condition? if so could someone point me in the right direction to learn more about this? it is nice to read such an incredable point about amoeba.but I have a question,about bacteria,that is amoeba agravate or getting worth when a person has an amoeba cist eats some types of food like vegitables,milk and milk products,fruits ..etc? Just learning that my Husbnd has an Amoeba in his intestines.He hasnt been out of the Country.His stomach problems have kept him home for a number of years.Any Idea as to how this could have been contacted.I did wonder if his having quite a few Colonascopy;s in a very busy office if this could be the cause. This is a very good article guys, thanx alot. Would someone tell me about amoeba found in fruits? And its cure. thank you so much, you helped me to understand Amoeba very well. this artcal helped me very much and it helped by giving me information i didnt know even though i studied it. Thank you very much. Hi! I feel the hunger of knowing more about AMOEBA.I wanna know where & when we can get this & also, how to avoid having this parasites! thank you po! May I know which part of the cell helps in the movement of the amoeba? Please explain to me as i don't really understand, thank you. what are the diseases it cause?and where does it live.and how does it reproduced? thank you for this information. I really enjoyed reading this site and it helped alot with my project again thanks alot. Thanks for the great info! It was just the information I needed layed out in an understandable form! Thanks alot! Just what I needed to answer questions on my assignment. Thanks for this! This is so cool!! !and just what i needed, i now know more about "ameba".thank$ for this. Thanks a lot! This website has helped me with my microorganism report! THANKS FOR THE ARTICLE. ITS REALLY GREAT. AM GOING TO GET AN A IN MY BIOLOGY PROJECT. Is anybody there to answer questions about the amoeba? I see many questions but no one answers. Thanks for this article.This is all what i need for my biology activity. THANKS ALOT.IT HELP ME ALOT TO KNPW ABOUT AMEOBA DISEASE.IVE LEARNED HOW TO PREVENT AND AVOID THIS DISEASE. Is, this amoeba aquatic or teresterial habitat and are they causing any disease to us, if they are. What is the name of the disease? Thanks a lot ladies and gentlemen l couldn,t know the amoeba but now l see. Do they have other type of Amieba ?? And by the way thank you very much for teaching this to me and to others !! Why Amoeba needs division when it can live as single? can you please tell me if amoeba does not have any organs and systems then how does it stays alive? Thank you so very much for xplaining amoeba in a short form. Thank you for giving in more information about amoeba...I've learnt more about amoeba & it gets to my attention that it also causes diseases. Thank for the informaton given. WHAT'S THE USE OF AMOEBA IN ECOSYSTEM.BIOLOGY is a very broad subject am running from. I like this article it give me a lot of information for my research at school. I like the information you provide. What you have given is very detailed and we can interpret also clearly understood. So i appreciate and thank you for helping..
thank you for telling me about amoeba it really helped with my lesson in biology I hope I can use this site again for other resources. thank you,this is for my biology assignment. it is really straight to the main point. thanks a lot! I've been searching for this all morning , the question is , " Where in the amoebas cell do most of the chemical reactions happen ? " and my question number 2 is , " The cell membrane of the amoeba has 2 jobs , What are they ? " thank you , they are my questions I hope somebody gets back to me asap because its for homework for tomorrow ! thanks , kind regards Catherine Chapman . Thank you this really help me in my biology assignment I love it this is just what I wanted to do my homework. After crashing a a knee board in a warm fresh water lake I very quickly got a severe sinus infection, was given antibiotics but once they were gone I got sicker, had viral meningitis and with in two days had h flu bacterial meningitis. Yes, I survived but with several psychological and emotional side effects that STRANGELY change from apt to apt. No one psychiatrist can give me a "true" dx. Could the ameba have survived in me? Seizures also present at times sometimes I see things but nothing sticks, so could it still b in me? "Thanks for the Article on Amoebas. I spelt it wrong for years. The information was fascinating. Have a great day." Thank you this website helped us with out project! What is the typical life duration of an Amoeba? What are common causes of their death? hello you helped me to get a c in my test thanks! I hope that you will read this to know that I am really grateful for this info. Really interesting and really helps!